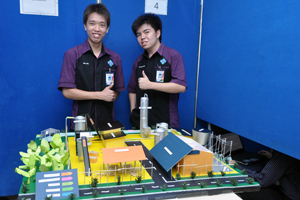 BANGI, 15 Dec 2012 –More than 200 chemical engineering students from 12 universities in the country took part in a programme giving a glimpse of the future of the profession in protecting the environment. 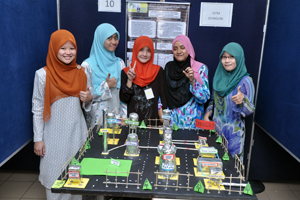 They were taking part in the 3 day National Chemical Engineering Symposium (NACES) 2012where the students were encouraged to come up with ideas on how to tackle climate change as a move to protect and preserve the environment. The symposium was organised by the National University of Malaysia (UKM) with the cooperation of the Ministry of Higher Education and the Ministry of Energy, Green Technology and Water. Various competitions were held during the symposium including Technical Essay Writing, Technical Video and Powerpoint Presentations, Malay Speech competition, Case study and Plant design exhibitions. The activities are meant to train the students on how to apply their knowledge and test their creativity in innovating environmentally friendly technology. One of the highlights were the technical plant model design, using mostly recycled material where the students are required to design a plant which enhances green technology. The objective is to reduce CO2 enmissions intothe atmosphere. 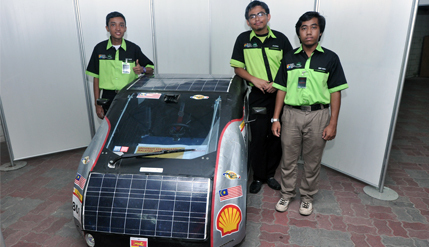 There was hope that future generation of chemical engineers will create a climate revolution by using green technology. The students gave a glimpse of how chemical engineering will be in the future having the potential to protect and preserve the environment. Agro waste producing ethanol, Algae harnessing CO2 and then converting them into bio-fuel, the combination of solar energy and reactor to produce fuel are just some of the ideas presented. The ideas from the students give hope that climate change can be tackled effectively using the environment itself. For example algae which need a high concentration of CO2 to grow. The participants were also able to express themselves well communicating their ideas and explain how their design works with minimal jargon a rarity with most technical people. Dean of Faculty of Engineering and Built Environment, Prof Ir Dr Mohd Marzuki Musatafa, lecturers, students attended the opening ceremony.